Each STUDY PLAN contains ALL the construction drawings for each material - STEEL & ALUMINUM as applicable to the particular boat plan - with up to 25 sheets per plan! Lists of materials - Technical information - Numerous construction drawings are all included. You can view & print the drawings in full or in sections. BUILDING PHOTOS are included in the study plan package. PLUS you receive a FREE (value 79.95) e-book BUILD YOUR OWN BOAT.When you use your credit or debit card you will be charged at the correct exchange rate in your own currency. L.O.D. (Length on deck) 10.36 m 34' 0"
L.W.L. 8.53 m 28' 0"
BEAM 3.66 m 12' 0"
DRAFT 1.22 m 4' 0"
SPRAY 340 A - Pre-cut steel kit or Cutting Files and boat plans. 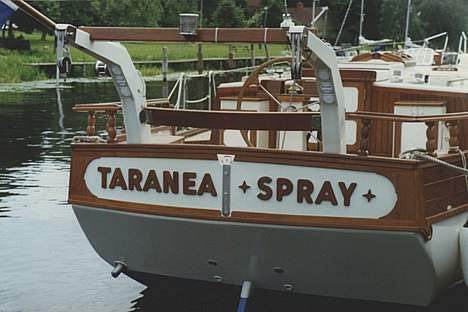 SEE SPRAY 340 B ( Pilot house version ) - Pre-cut steel kit or Cutting Files and boat plans. The original Spray 33 has been enlarged to create this new kit. 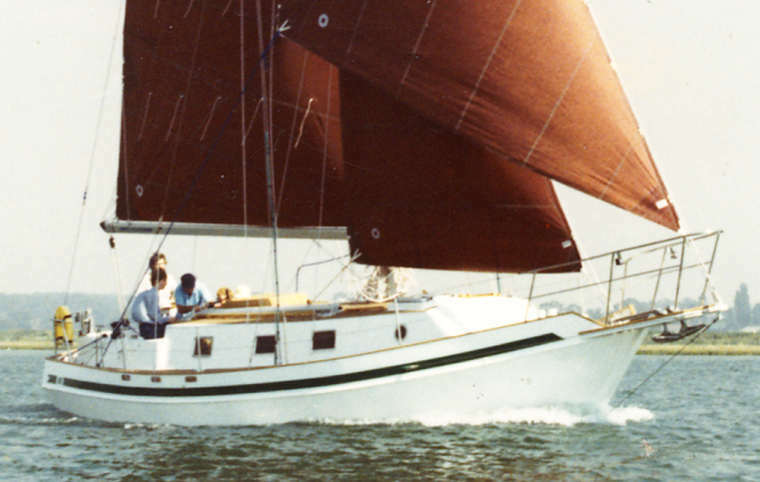 With hundreds of S33's in service worldwide, we felt NOW was the time to update this sailboat. Since starting work on this project we have realized the huge potential of this boat design. The new versions in the Spray 340 series offer something for all. Please check out the general arrangements and see how one of these can be the basis of YOUR boat. Spray 340 is only available from AUTHORIZED Bruce Roberts DESIGN OFFICES. During the conversion from the Spray 33 to the Spray 340 Kit we have made subtle changes to the bow; this allowed for easier fitting of the forward plates plus an increase of space in the internal accommodation areas. Check out our e-book BUILD YOUR OWN SAILBOAT for details. 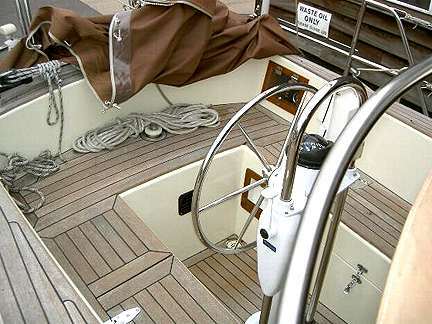 - GIVE ACCESS TO HUNDREDS OF step by step BOAT & KIT ASSEMBLY PHOTOS. Varied accommodation arrangements are possible. 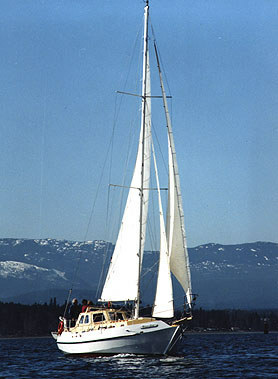 Bmu Cutter, Gaff Cutter, Gaff Schooner, Junk Schooner (shown). Deck and accommodation plan. The accommodation may be re-arranged to suit owner but check with designer first before making major changes. Asi loves to play with his boats; this is the new rig he has had me design for his Spray 33 / 34 - the rig in now available with Spray 340 kit. GIVE ACCESS TO HUNDREDS OF BOAT & KIT ASSEMBLY PHOTOS. 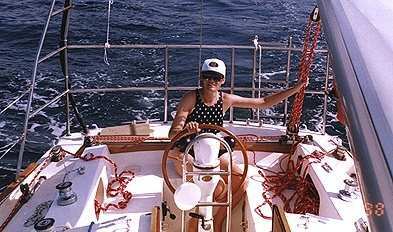 Joan Mc Dermott at the helm of the Spray 33 that she and husband John built in Oman. I have just received my boat plans for the Spray 33. I am overwhelmed by the number of drawings and the detail including deck fittings right down to the boat plans for the Roberts Dinghy. This is not my first boat building experience. I have built what my wife refers to as "toy" boats, a 14' wood /epoxy daysailer and a 20' cedar strip canoe. This will be my first "serious" boat building experience and I am looking forward to getting started. Having looked them over I can see where the cost lies. The boat plans from other designers do not compare. 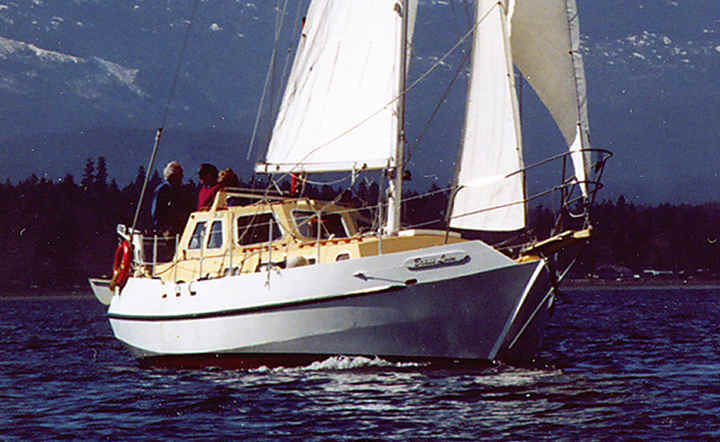 I would not hesitate to recommend Bruce Roberts for boat building boat plans to anyone who might ask. Sincerely, Rick Deschenes "If you spend all your time trying to get even, you will never get ahead." 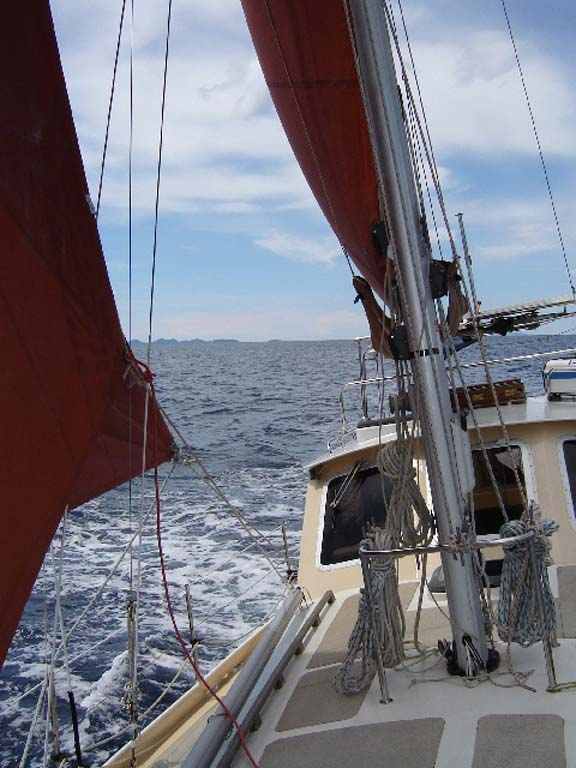 S/Y Blue-Belle, British, Bermudan Cutter, Homeport London, build 4mm steel, owned and sailed by Derek and Hulya Leigh. We arrived at Park Kemer Marina/Turkey in July 2004 after our return trip across the Atlantic from Florida/USA. My wife is Turkish, and, being one of the few Turkish girls to sail the Atlantic twice, is attracting a lot of media attention here, needless to say so is the boat. Our Spray was featured on national TV in august and created enough interest to warrant a repeat showing. Since then we have been featured in four Yachting Magazines- the Antalya Regional Magazine- and a video of Blue-Belle crossing the Atlantic was shown at the Antalya Boat Show to a very enthusiastic audience. The Turkish Chamber of Shipping have also conducted an interview to be featured in their commercial publiCATAMARANion 'Turkish Shipping World'. We have a constant stream of visitors and Suat Zeybek of the Dive Centre is one of our regulars. He is keen to build a Spray 36 and I believe he has already purchased the boat plans.